Green Alkanet is not easily confused with other wild plants on this web site. 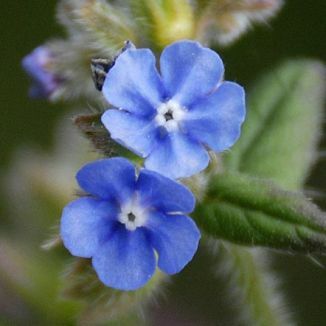 This is a medium sized perennial which has beautiful little bright blue white-throated flowers (10mm across) in long-stalked, leafy coiled cymes. Its pointed oval leaves are covered in stiff little hairs. A garden escape, it flowers between April and July and is thought to have come from France, Spain and the Mediterranean. 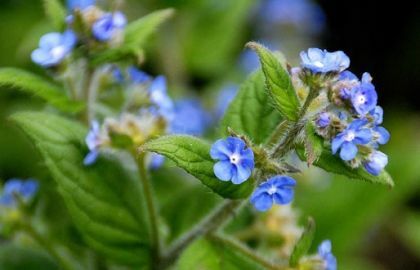 Green Alkanet grows mostly along the east coast of Ireland but is found in many gardens, however be warned, once it gets into your garden, it is quite difficult to expel it as it has a very stubborn tap root. This plant is much visited by bees and belongs to the family Boraginaceae. I first identified this flower in Killiney, Co Dublin in 1976 and photographed it in Dalkey in 2006. It is thought that Green Alkanet was originally used as a source of red dye, like henna, which comes from its roots.